If you are a member of Oxford University and are on-site using a PC, Mac or Unix workstation within the ox.ac.uk domain, you will be able to access most electronic resources without requiring a username and/or password. Some resources (like EBL or Ebrary) may still prompt you for your Oxford Single Sign-On (SSO) or require an additional login (see Additional Logins box below). If you are off-site, log in to SOLO ("My Account") with your Oxford Single Sign-On (SSO). This will give you remote access to all e-book platforms as well as all databases, electronic reference works and e-journal packages. If you have forgotten your SSO or need help with it please visit the IT Services username web page. Some e-book platforms require you to register for your own username in order to get access to the platform or to enable greater functionality like downloading. To download e-books you will need to create a personal account on EBSCOhost. Find out more about creating a My EBSCOhost Account. 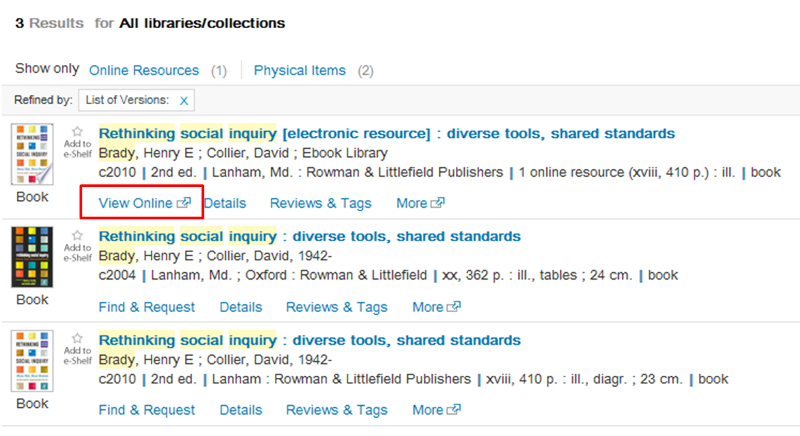 An additional account is not needed to read EBSCOhost e-books via the web-view online. The library catalogue SOLO is the best place to find individual e-books. Simply search for the book you want and if an e-book is available it will appear along with the print version of the book. From here you can click on the title of the book or View all versions and then click on View Online to read the e-book itself. For subject specific e-book collections please take a look at the libguide for your subject - available under Subject resources on the Oxford LibGuide main page.